The goal of the Indic NLP Library is to build Python based libraries for common text processing and Natural Language Processing in Indian languages. 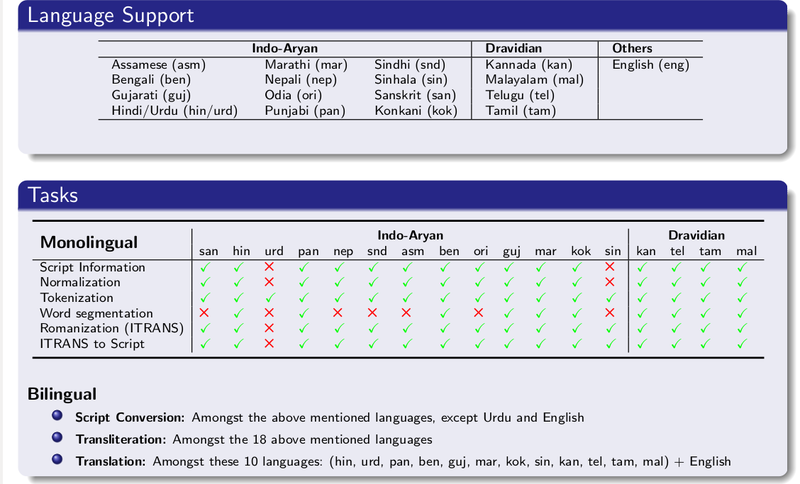 Indian languages share a lot of similarity in terms of script, phonology, language syntax, etc. and this library is an attempt to provide a general solution to very commonly required toolsets for Indian language text. You can check the documentation for each normalizer in the file src/normalize/indic_normalize.py to know the script specific normalizations. <language>: 2-letter ISO 639-1 language code. <language1>,<language2>: 2-letter ISO 639-1 language code. A trivial tokenizer which just tokenizes on the punctuation boundaries. This also includes punctuations for the Indian language scripts (the purna virama and the deergha virama). It returns a list of tokens. Unsupervised morphological analysers for various Indian language. Given a word, the analyzer returns the componenent morphemes. The analyzer can recognize inflectional and derivational morphemes. Support for more languages will be added soon. <resource_directory>: Path to directory containg Indic NLP library resources. indic_string=u'आपल्या हिरड्यांच्या आणि दातांच्यामध्ये जीवाणू असतात ." 0.1 : 12 Mar 2014: Initial version. Supports text normalization. Indic NLP Library is free software: you can redistribute it and/or modify it under the terms of the GNU General Public License as published by the Free Software Foundation, either version 3 of the License, or (at your option) any later version. Indic NLP Library is distributed in the hope that it will be useful, but WITHOUT ANY WARRANTY; without even the implied warranty of MERCHANTABILITY or FITNESS FOR A PARTICULAR PURPOSE. See the GNU General Public License for more details. You should have received a copy of the GNU General Public License along with Indic NLP Library. If not, see http://www.gnu.org/licenses/.